Keyforge is the new hotness! Get in on this exciting new game from the mind of Richard Garfield at our Learn to Play event followed by a tournament for a free deck! 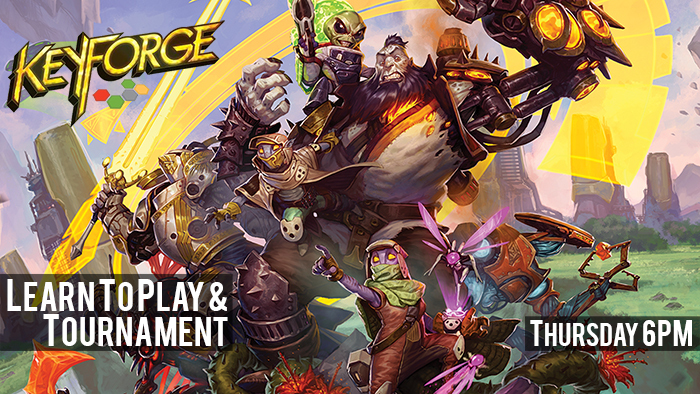 At 6pm, we'll have staff on hand to teach the basics of Keyforge and give you an introduction to the game and tournament format leading into our $5 three-round Swiss tournament at 7pm, where the winner will receive a free deck! We have more prizes in the pool for top finishers, and participation promos just for showing up! The tournament format will be as follows: bring your worst deck and swap with your opponent each round (just make sure to get it back at the end of the game)! Matches will be best-of-one with a 50 minute timer. This tournament will require a minimum of four players to fire. Format: Three-Round Swiss / Bring your worst deck and swap!